Don’t hold me to this, but I think the present Yoyogi Station wasn’t actually part of Yoyogi Village. Once again, I want to throw out a million thanks to my readers. If none of you followed, commented, messaged or just generally showed up, I wouldn’t be able to continue. Y’all make this so much fun. I was asked by a reader the other today to talk about Yoyogi. So I bumped it up in the pecking order. Hope this is a good one. 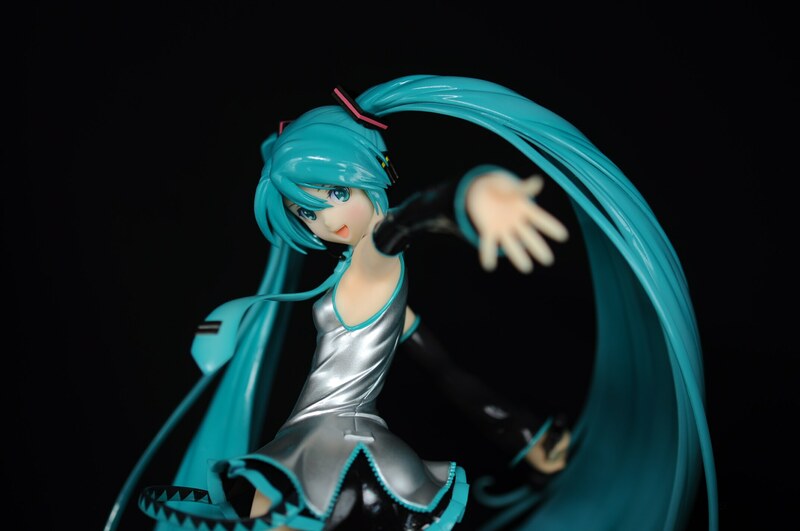 And for no particular reason, here’s Hatsune Miku. The name 代々木村 Yoyogi Mura Yoyogi Village is attested in the writings of the Sengoku Period. But it’s not clear where that name came from. There’s a good chance the name is much older than the Edo Period. But without other records, we can’t say. 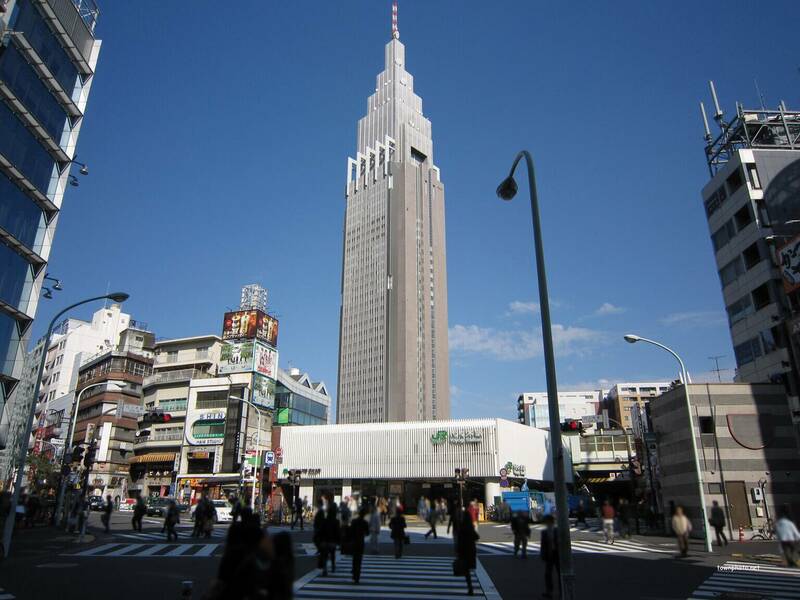 In the Edo Period, the area called Yoyogi was what is now more or less the Meiji Jingū and Harajuku Station area. The simplest explanation seems to be the most believable to me. There were a lot of trees in the area for a long time – generations, if you will. There are a few slight variations of this theory. The reason I put off doing this place name for so long[i] was because sorting thru all the details of etymologies that varied little except for a slightly different angle or a curious anecdote was too time consuming. Given the amount of time and effort I’ve put into JapanThis since that time, this topic seems much less daunting now[ii]. And in reality, it wasn’t difficult to research this one. One theory states that 皀莢 saikachi honey locust trees were cultivated here[iii]. I like this theory best because it’s simple and plausible. It doesn’t try to hard. 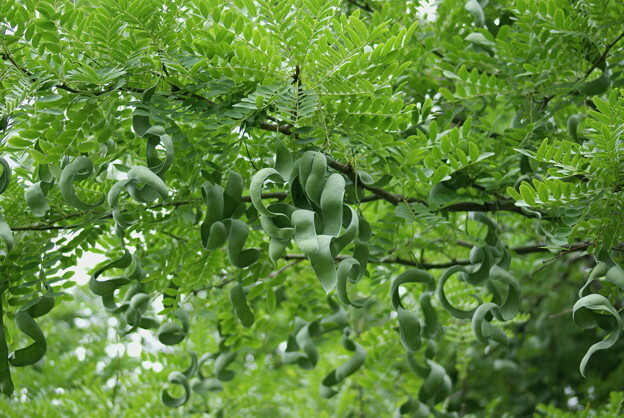 This is a close up a honey locust tree. You can see its bean pods. Another theory states specifically that on the Ii family’s lower residence, which made up part of Meiji Jingū and some of the hill at the high point of Harajuku, was covered in 樅 momi Japanese fir trees. This story has some cool anecdotes attached to it, but reeks of folk etymology. 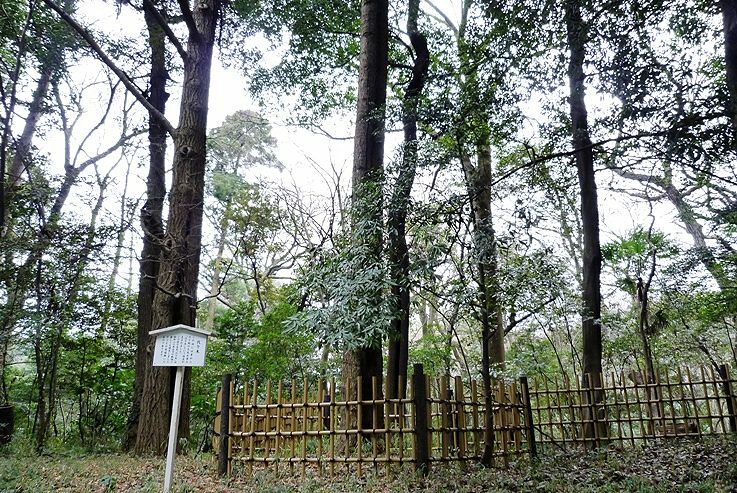 It should be noted that today both types of trees exist in the area around Meiji Jingū, although after WWII, local trees from all over Japan were donated here during the rebuilding effort. Also, the area that is now Meiji Jingū Gaien was the original site of the Ii clan’s palatial lower residence’s tea garden. To my knowledge, nothing remains of the site. 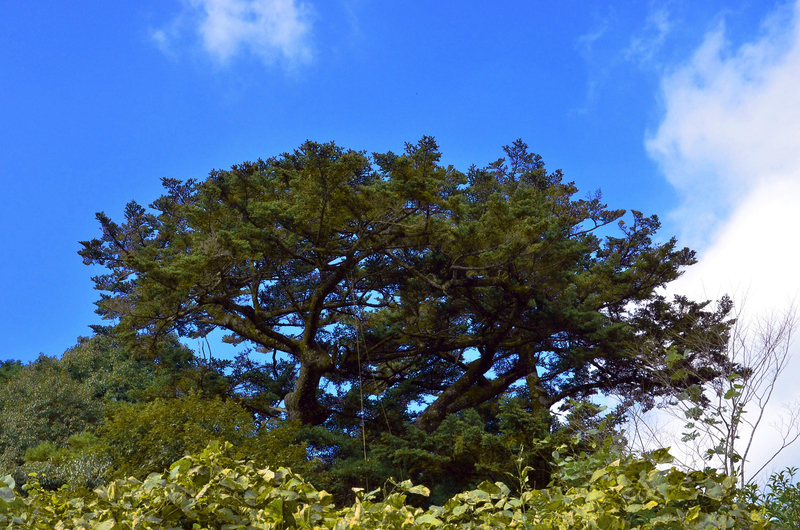 If you go to Meiji Jingū, near the garden’s east gate, there is a tree with a sign that says 代々木の大樅 Yoyogi no Ōmomi The Great Japanese Fir of Yoyogi. The tree is no bigger or smaller than any of the other trees near it. But the story goes that once upon a time, there was a super tall Japanese fir tree that had stood here for generations. The current unimpressive tree is a replacement that stands on the site of the original Great Japanese Fir of Yoyogi Village. This is where the sign says the big fir tree of Yoyogi was. Note: it’s not a fir tree…. It was said that this 大樅 ōmomi great fir tree on the Ii family’s lower residence was so great, that mapmakers from the shōgunate would climb to the top of it to survey the city. Another anecdote states that the Ii family’s watchmen would keep an eye on the family’s upper residence which was located near the 桜田門 Sakuradamon Sakurada Gate[iv]. In fact, it was said that you could see all the way to Shiba and Edo Bay. Utagawa Hiroshige even painted a picture of the tree titled 代々木村ﾉ世々木 Yoyogi Mura no Yoyogi The Generations Old Tree of Yoyogi[v]. There was an imperial residence built on the site of the Ii family’s lower residence[vi]. The tree was preserved… or at least the location of the alleged tree. Eventually the land was incorporated into Meiji Jingū and, as I said, the old tree doesn’t exist anymore, but the new tree does and it has its own sign. So, good for it. [i] When I started looking into place names, it was one of the first I wanted to write about. [iv] I’m sure I’ve alluded to the Sakuradamon Incident (which sounds like a euphemism, it should be called “the Assassination of Ii Naosuke at Sakuradamon”). Many people consider this the opening of the Bakumatsu. [v] The Yoyogi of Yoyogi. See what he did there? In the second “yoyogi” he used a variant for 代々 daidai/yoyo generations 世々 yoyo. I can’t find this picture on the internet, so if someone can help me find it, I’d really appreciate that! [vi] Remember, the lower residences were much more palace like and rustic than their urban upper residences near the castle. When the Meiji Era urban sprawl began in earnest, the Harajuku area became a prime target for rich people and the elite imperial family who wanted to build their own estates in the area.